It is so easy to make a special baby shower gift when using the right pattern. 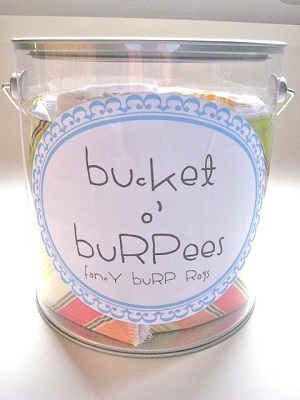 Here is a pattern for making burp rags for baby then placing it in a clear bucket labeled "bucket of burpees". Make a bunch, fold them all together, roll them up and place in the bucket. When picking out fabric, choose prints and colors to match the baby's nursery. Here is a handy way to store burp rags plus add to the decor of the nursery. With just a few pieces of fabric and cotton diaper plus a little bit of sewing you can have an awesome gift for mother and baby.